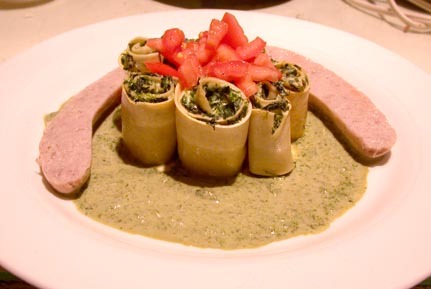 I looking into the Italian cooking experience. In the past couple weeks these were the best dinners that I made with recipes from the magazines, Cucina Italiana and Italian Cooking and Living. I've added recipes to the pictures (Feb 27), just click on the pictures and the recipe will open in another window. 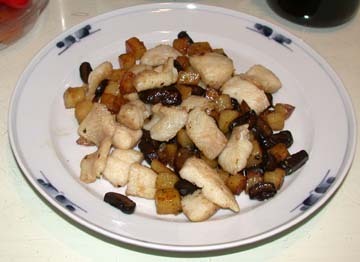 This is Basa (Fish) with potatoes and mushrooms, a new experience as I cooked the potatoes in a skillet in olive oil from the raw state without parboiling. Seasoned with Thyme, white wine and butter, salt and pepper. An apple Charolotte alla Milanese. Apples are peeled, cored, sliced and slightly softened in boiling water with wine, sugar and lemon rind. 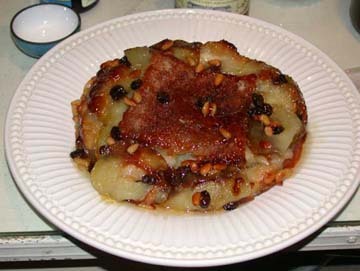 The slices are then layered in a dish with rasins, white bread, butter, sugar, and pinenuts, then baked and turned out on a plate. This was really good, ice cream would ruin its effect. The pasta sauce here is made of butternut squash and sausage, it's tempered with cream and parmegiano reggiano cheese; the recipe made so much we had two meals and a lunch out of it. 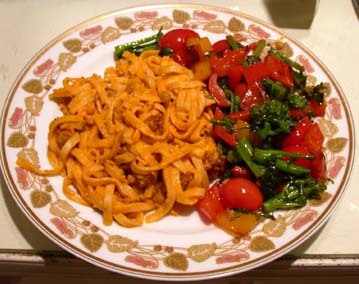 It reheats well, this time we ate it with sauteed broccolli rabe with red and yellow peppers. 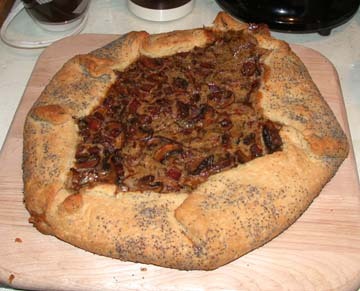 A savory porcini and prociutto tart, it is like a fritata (omelette) baked in a rich crust. 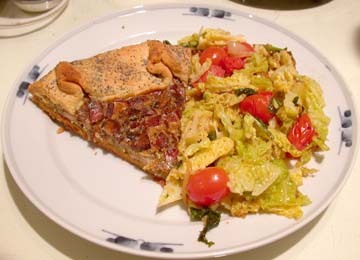 We ate it with sauteed savoy cabbage and mini tomatos. These are chicken thighs stuffed with prosciutto and fontina, a little time consuming but worth it. 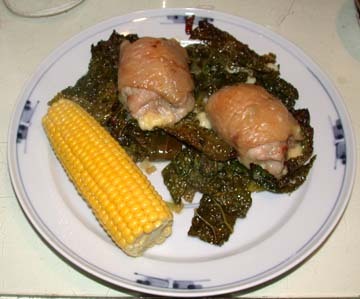 The recipe called for baking the thighs on escarole, but I did it with savoy cabbage and it still turned out well. Some of the cabbage got a little crunchy which added an interesting crunch and toastiness to the vegetable. 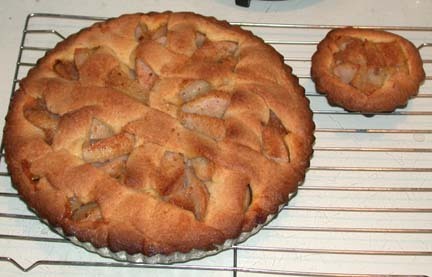 This is the last new thing I tried, a pear tart baked in a lemony polenta pastry. The pastry was wet and a little difficult to handle but it was well worth it. The tart was subtly rustic and very satisfying. 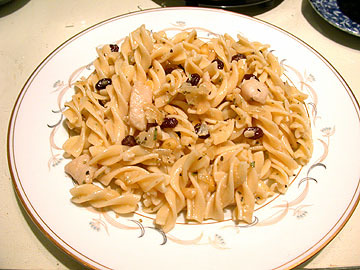 The new Italian dish this week was a recipe for Salt Cod with rasins and pine nuts in pasta. It's something that goes together in about 20 minutes (after you soak the cod and change the water twice a day for three days.) I changed the fish to Basa and decreased the amount of pasta. Full details are attached to the original recipe (click on the picture). White as this dish was it really tasted good. Marjoram and rosemary are one of my favorite flavors. The new Italian dishes were a little difficult this time. The magazine section is Rapido e Semplice the first two took twice the stated time. It may have been my inexperience with slippery, very hot, 8" square pieces of partially cooked pasta in the first case. The additional time necessary to cut all the vegetables may have been overlooked by the editors in the other recipes. The food, however was worth the effort and I am sure, having done it once now, it will be easier the second time around. CLICK on the photos for the RECIPES. This dish took some time. Handling the wet pasta sheets was a bit of a challenge. And the cooking took longer because I wanted it to match the magazine photo. Food stylists that run around the food photo shoots with a blowtorch toasting the ends of pasta to make them more appetizing, should be reprimanded. I wound up baking them for 25 minutes and brushing the rolls with olive oil and butter (to keep the pasta supple), the ends still didn't brown like the would with a blowtorch. . . I added the weiss wurst to complete the dinner with some meat. 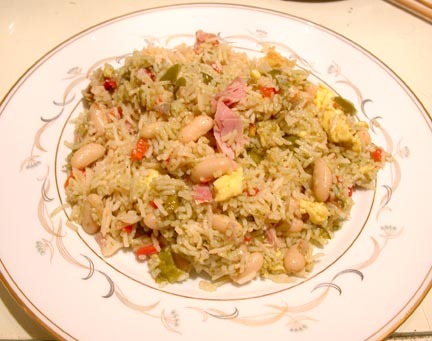 This is a very satisfying one dish dinner, Beans and rice Italian style, it does involve a lot of chopping, a good sized pot, a small skillet, and your blender.